Not only do insects eat things themselves, but insects are by far the largest source of food for animals that eat meat or flesh, both on the land and in freshwater. One entomologist has estimated that the world population of insects at any one time is about 1,000,000,000,000,000,000 (one quintillion) individuals. Although insects are relatively small, they are so numerous in most terrestrial and freshwater environments that they not only outnumber, but also outweigh, all of the other animals combined. That includes the really big animals, such as horses and elephants! Because of their large biomass (amount of living material), insects are the most significant link between plants and other animals in food webs. Birds, reptiles and mammals (even some humans) are predators (animals that eat other animals) of insects, thus they connect the energy of the sun with all other animals. Because insects eat things themselves and are eaten by other animals, they are often very important members of food webs. In any community or ecosystem organisms eat one another. If we draw a diagram connecting the organisms that eat each other we will construct a food web that shows how energy is transferred among organisms. Insects are very important members of most food webs. Typically food webs are organized using trophic levels— with the primary producers as the first trophic level, the herbivores, or primary consumers, as the second trophic level, and the carnivores, or secondary consumers, as the third trophic level. There also can be a fourth trophic level that includes the carnivores that eat the carnivores that eat the herbivores that eat the plants! The primary producers are the photosynthetic organisms (plants). The detritivores breakdown the bodies of the plants and animals after they die. One important thing about food webs is that the energy transfer between the trophic levels is not 100% efficient and energy is lost at every step. Where does the energy come from in the first place? Figure 8.19: Grasshoppers are very important in this food web. 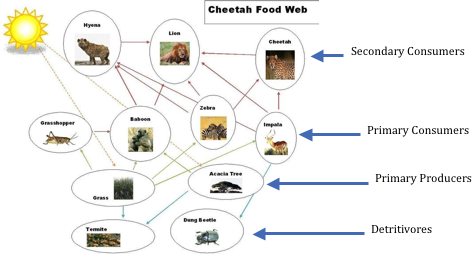 Notice that the connections at the top of the food web might make one consider that the lion could even be considered a fourth trophic level!